Fantastic Fascias - Fascia/Soffits/Guttering, Roofer, Windows/Doors/Conservatories based in Reading, Berkshire. 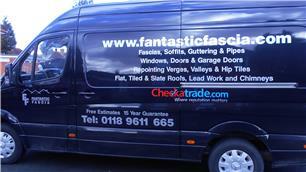 Fantastic Fascias was started in 1990 and has become a great family company with just family members. All the staff and fitters are insured, professional and skilled in their own departments. We have no salesman or sub-contractors and low over heads, so we can offer a great, top quality service with what we believe are top of the market products that everyone can afford. We are specialists in cladding and replacing old roofline with new UPVC roof line products and we also do outside painting . It does not matter how big or small the job is or how far or near, we never let anyone down and get quotes out within 7 days of a site visit. Our aim is your recommendations and we treat each job and property with 110% care to detail. We ask for no deposit only payment on completion as we know at Fantastic Fascias we do a fantastic job on every job we do and no less . When we do a site visit to your property we will take no longer than 30 minutes of your time (guaranteed). Craig will be the person you will deal with from the first visit at your home and will also be doing the fitting and making sure its to you complete satisfaction and also after care as we believe in dealing with the same person from start to finish.